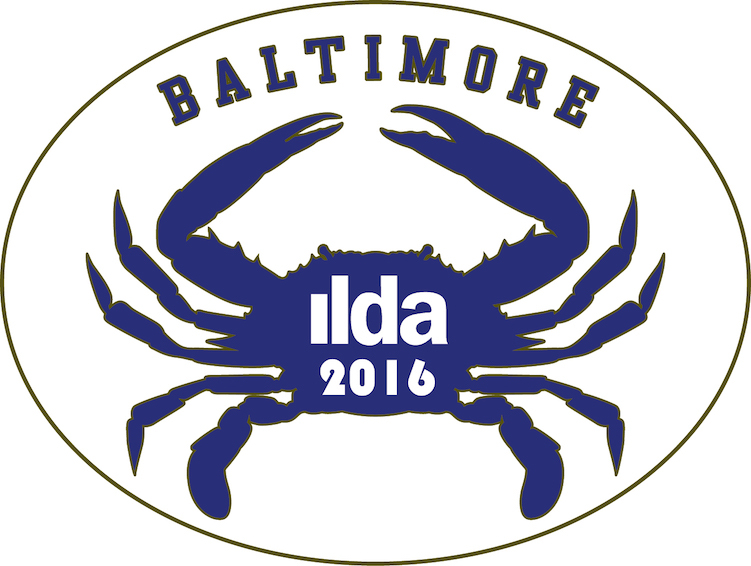 The 2016 ILDA Conference was held in November 2016. It is no longer possible to register for the hotel or events. The remainder of this page is left for reference, as it appeared before the Conference. • Sun, Nov 6: LSO course (optional), Pangolin User Group meeting (12 noon - 6 pm, free to anyone; not an official ILDA event). The first official Full Conference event is the Welcome Cocktail Reception and Buffet Dinner on a ship cruising the Inner Harbor; boarding at 4:30 pm, cruising 5-7:30. Cruise info and menu here. 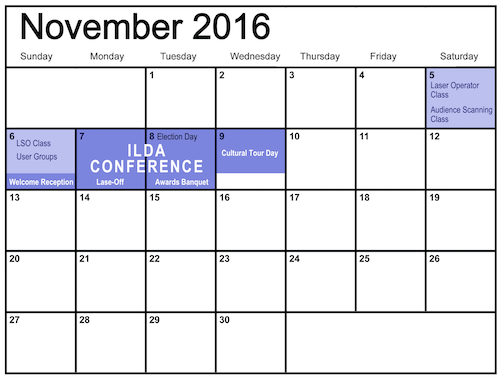 • Mon, Nov 7: ILDA General Business Meeting, Advanced Technology Workshop. Lase-Off & Laser Jockey competition. We also have invited personnel from the U.S. FDA laser regulatory agency for a 2-hour discussion on Monday afternoon. • Wed, Nov 9: Cultural Tour (optional), bus tour highlighting Washington DC sites. Drive by or visit many sites scheduled to include: Arlington National Cemetery, National Cathedral, White House, Lincoln Memorial, Vietnam Veterans’ Memorial, Korean Veterans’ Memorial, Martin Luther King Memorial, FDR Memorial, Jefferson Memorial, Smithsonian buildings, U.S. Capitol, and Washington Monument. Leave at 9 am, return by 5 pm. The Conference hotel is the Royal Sonesta Harbor Court Baltimore, on the famed Baltimore Inner Harbor. A night view of the harbor is shown above; the daytime view from the Royal Sonesta is below. Hotel room rates are $165 per night for a single; this rate includes breakfast. A double is $185 per night. For each additional person in a room (up to 4), there is a $20 per night charge. For example, the rate for three people in a room is $205. You can reserve your room by telephone or on the internet. Provide the Group Code which is “1105ILDACN”. • Sonesta hotel reservation website - click the button below. Note that when you get on the webpage, the Group Code should already be filled in. Please note that ILDA registrants staying at the Royal Sonesta receive a $250 discount on their ILDA Conference Registration. Those who stay at other hotels or locations will have a higher ILDA Conference Registration rate (e.g. paying $250 more) based on ILDA’s contract with the Royal Sonesta. ILDA guarantees a certain number of room reservations and we are charged extra for persons attending the Conference but not staying at the hotel. • Full Conference registration includes all meals, welcome reception, Lase-Off, Awards, business meetings, seminars, and workshops. • Spouse/Guest registration is similar but does not include any business meetings, seminars or workshops. A Spouse/Guest is defined as a person staying in the same room as a Full Conference registrant. 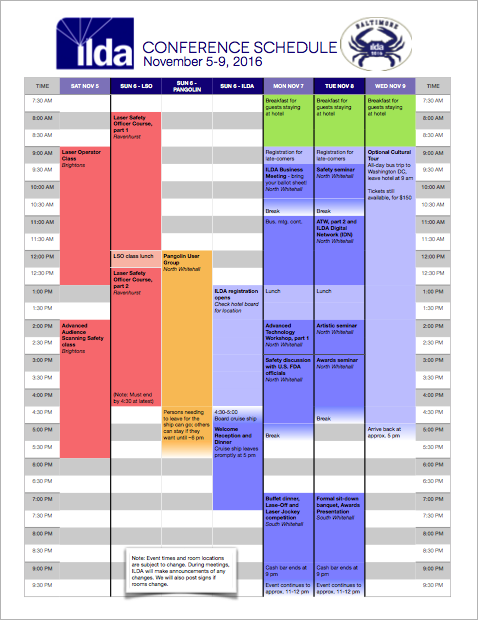 Full Conference and Spouse/Guest registrations do NOT include any laser safety classes or the Cultural Tour, which are separate Conference events. Also, Full Conference and Spouse/Guest registrations do NOT include hotel room reservations, which are made separately with the Royal Sonesta Harbor Court hotel. Note: Prices include a $250 credit for if you book your room at the Royal Sonesta Harbor Court hotel, using the ILDA group code listed above. If you do NOT book direct with the hotel at the ILDA group rate, your ILDA registration cost will be $250 higher, in order to cover ILDA's hotel contract penalties. Note: Prices in green include a $250 credit if you book your room at the Royal Sonesta Harbor Court hotel, using the ILDA group code listed above. Prices in red are the cost if you do not book with the hotel at the ILDA group rate; these higher prices allow ILDA to cover hotel contract penalties. • Attendance at the General Business Meeting is free for current ILDA Members. This event is where votes are taken for ILDA Board Members and for ILDA President, and where association business is discussed and voted on. If you wish to attend only the Business Meeting, you do not need to register for the Full Conference. However, you must register in advance for the Business Meeting at the Event Registration page. This event will be visible only to current ILDA Members (it will not appear on the list of events for non-members). • Optional Laser Operator Safety, Saturday November 5, 9 am - 1 pm. Basic lightshow safety, for persons working around lasers or who are operating lasers for lightshows and displays. $295 for ILDA Members, $420 for non-members. • Optional Audience Scanning Safety, Saturday November 5, 1 pm - 6 pm. How to do safe, legal and effective audience scanning at laser lightshows. For both operators and show designers. Prior laser safety experience or courses are recommended. $295 for ILDA Members, $420 for non-members. • Optional Laser Safety Officer for U.S. Lightshows, Sunday November 6, 9 am - 6 pm. This covers laser shows only -- no medical, industrial or other non-lightshow laser usage. While European and international regulations are discussed, the majority of the regulatory discussion is on U.S. laser and aviation issues. To take this class, you must have prior laser show experience, or have taken ILDA's Laser Operator Safety course. If you have questions whether you are ready for this class, contact ILDA. More info is at the LSO course page. $525 for ILDA Members, $650 for non-members. A lunch is included. • Optional Bus Tour of Washington DC, Wednesday November 9, $85 per person (ILDA Member, non-member, spouse or guest — all the same). Includes box lunch. Don't forget to make your reservations directly with the Conference hotel as described above.